Our canine friends have earned a reputation for having notoriously bad breath. After all, they are known to drink out of toilets, sniff a lot of butts, spend a good part of their day cleaning themselves, and the food they drink doesn’t smell appetizing to most humans. However, good oral hygiene is vital to the health and wellness of your dog. Preventive dentistry through your Southeastern Massachusetts veterinarian can help to thwart common health issues, including problems with the kidneys, liver, and heart. Overall, dental care for pets can help your dog to live a longer, healthier life. Friends usually have a lot in common, and when it comes to the oral bacteria found in dogs and their owners, there are many similarities. The most significant difference is that dogs rarely get cavities because their diet does not contain as much sugar as the average human intake. However, many dogs experience a similar rate of periodontal inflammatory disease, which is why advanced dentistry in Dartmouth is so important. Each dog has 42 permanent teeth, all of which should be brushed regularly at home and treated with professional canine dental care each year by a qualified veterinary dentist. Increased rates of bacteria that cause periodontal disease can migrate throughout the body, resulting in systemic diseases and conditions, including endocarditis, pulmonary fibrosis, hepatitis, and chronic bronchitis. 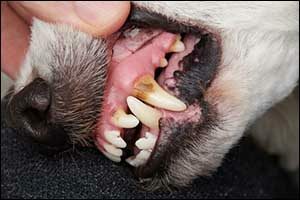 Sadly, periodontal disease affects as much as 80 percent of all dogs by the age of four. Pet owners can look for symptoms and can seek dental care for pets at Anchor Animal Hospital in Dartmouth. Bad breath is definitely a symptom, but so is a loss of appetite caused by a painful mouth when eating, changes in behavior, nasal discharge, sneezing, excessive saliva flow, gingivitis, and periodontal abscesses, just to name a few. Your veterinarian will check your pet’s mouth during annual check-ups, but if you notice that your pet appears to be in pain or if any of the above symptoms sound familiar, schedule a canine dental care appointment. Teeth can become loose when the roots become weak, or they can just fall out on their own. X-rays should be taken to determine the extent of the services required for advanced dentistry in Dartmouth. All is not lost if your pet is diagnosed with periodontal disease. It can be treated if it is caught early. There are treatment options through your Southeastern Massachusetts veterinarian that can slow down the disease progression to make your dog feel more comfortable. Non-surgical therapies are always the first course of treatment suggested. Polishing, scaling, ultrasonic scaling, and irrigation are just some of the methods that can be used. Surgeries can be required, as well as tooth removal if the disease is left untreated and progresses too far. Your veterinarian will go over the x-rays and test results with you to prescribe a course of action that will provide the best outcome for your pet. The best thing you can do for your pet is to provide preventive treatments. Dental hygiene for pets has improved significantly for pets in recent years. The equipment and procedures that are used to deliver dental care for pets are the same as the ones that are used on humans. While some procedures may require an anesthetic for the safety of the dog and the technician, others may be done at home. Ask your veterinarian about at-home canine dental care, tips for brushing, and other techniques that you can apply in between visits. Advanced dentistry in Dartmouth is available at Anchor Animal Hospital, but good hygiene should be practiced by pet owners as early as possible to get pets used to at-home brushing and care. For more information about dental services through your trusted Southeastern Massachusetts veterinarian at Anchor Animal Hospital, give us a call at 508-996-3731. We can schedule an appointment for a veterinary check-up or canine dental care, depending on your needs. Our team of highly trained, skilled, and experienced veterinary technicians and doctors can answer any questions that you might have about dental care for pets. Call today to schedule an appointment or to learn more about the services that we provide.